Asking any manga fan from China the question "How is the manga publication market doing in China?" will most likely yield an "It's a mess." Why is the market such a mess? To understand the current mess in China, one needs to first be familiar with the history behind China's manga publication scene. Some say it all began with Picture Book King and the 5155 Project that came after its cancellation. Created in 1994 by Chengdu Hope Press, Picture Book King was the first real manga magazine published in China that also serialized original Chinese comic. Some say Picture Book King was the magazine that created the manga publication market in China. Back then, students would race to bookstores looking for the latest issue. However, before a year could pass, the magazine suddenly died. While no one knew the real reason behind Picture Book King's demise, some speculate the magazine was killed by the "fossil generation," who viewed such manga publication as inappropriate. Then came the China Animation Publication Project (also known as the "5155 Project") in 1995, a project headed by China's Central Propaganda Department and the News Publication Administration. The goal of the project was to establish 5 publishers, which in turn would establish 15 large-scale comic publications and 5 original Chinese comic publications. The five original comic publications that were created had a particularly large influence on the Chinese manga market, they are: China Cartoon, Beijing Cartoon, Youth Comics, Comics King, and Cartoon Edge. The "5155 Project" marked the beginning of a new wave of manga anthologies, magazines, and original comics, most of which followed the vision of their editors, and placed their writer's enthusiasm as their priority. However, ten years later, the quality of these publications did not improve. As a result they're now faced with a difficult obstacle. Many believe that 2006 marked the beginning of the nightmare for Chinese manga publications, but some argue the gear was already set in motion in 2004, when Touch, a magazine specialized in professional animation creator, ceased publication. Whether the magazine was cancelled because of its inadequate use of funds, or its unstable market position, no one will ever know. In the middle of 2004, Shanghai Century Publishing Group's animation subdivision launched an ambitious new publication titled Slow Motion (a pun for Comics Motion). Slow Motion was made up of two separate magazines, the bi-monthly shonen magazine GoGo Top and the monthly shojo magazine GoGo Happy. The goal of Slow Motion was to push the manga industry in China by introducing ideas and works from other countries (namely Japan). With a low price (6.50 yuan, around 0.80 dollars) and high quality contents (an average of 232 pages per issue), the publication sold like hot cakes. In 2005, Slow Motion and Ji Mei Comics (an anthology published by Jilin Fine Arts Press that serialized Detective Conan, Doraemon, and other Shogakukan series) became the forerunners of the Chinese manga magazine market, but soon the former fell to its own popularity. Due to Slow Motion's low price, it became increasingly difficult for its publisher to make a profit. In September of 2005, the magazine was turned into a children's magazine and was renamed to Slow Motion Wa 0. Just barely a year after its creation, the magazine that carried the hopes of the entire industry fell. Ji Mei Comics, on the other hand, was re-launched as Long Comics (Dragon Comics) in January 2006, and turned its attention to a much younger audience. Its publisher claimed that the magazine's circulation had remained stable. In July of 2004 Jilin Fine Arts Press launched a new shonen/shojo anthology called Star Comics. For two years, the magazine serialized series from Japan and South Korea, in no time it became a leader in the anthology market. In July of 2006, Jilin Fine Arts Press re-launched Star Comics as Long Comics Shonen Sunday (Dragon Comics Shonen Sunday). While circulation remained stable, this incident raised the question of whether the manga market, especially manga anthologies, will ever be successful in China. In early 2006, Fantasy, the only Chinese magazine that serialized western comics (America and Europe) and commercial illustrations from around the world, ceased publication. Around the same time, the sci-fi manga magazine SF World Periodical also ceased publication after years of struggle. In May of 2006, Beijing Cartoon, one of the forerunners of original Chinese comic, went on hiatus. 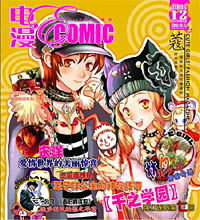 Dian Comics (Electric Comics), a shojo magazine from the Publishing House of Electronics Industry that focused on original Chinese comic, also ceased publication. Both Beijing Cartoon and Dian Comics received praise for their effort in publishing original Chinese comic. During the 7th Beijing Cartoon Comic Expo in 2005, when representatives from both publications met and gave encouragements each other, no one would have thought both magazines would be cancelled a year later. According to recent reports, China Fine Arts Publishing's Youth Comics, another pillar of original comics and a result of the "5155 Project," will soon be cancelled. Cartoon King, a bi-monthly magazine born from the "5155 Project," struggled throughout 2005 due to many editorial changes. For a few months the magazine became a seinen manga anthology, a month later its name was changed to Cartoon King - Let You Place UNIONE. Today the former leader of original Chinese comics has completely disappeared from the map. Some say the magazine announced its own cancellation sometime in 2006. Cartoon Edge, another "5155" magazine, struggled for many years as a manga anthology. Signing a contract with Shanghai Dragon TV and becoming an information magazine did not help. In 2006 the magazine was already long gone after being turned into a small publication called Original. In the manga information scene, the popular bi-monthly Chinese anime/manga digest XinGanXian announced its cancellation in the summer of 2006. XinGanXian was known for its unique content, reader friendliness, and excellent reviews. While there were many reasons behind XinGanXian's cancellation, the fact that it was cancelled during a turbulent time for Chinese publications raised many debates. A similar magazine called One Anime was also cancelled in the same year - not even a year after it was launched. Another magazine worth mentioning is ComicFans, which together with XinGanXian was two of the "must buys" for manga fans, especially those still in elementary and middle school. With XinGanXian gone, some have felt the quality of Comics Fan is one a decline. Some say the fate of these publications was caused by the entry of Japanese publishers (like Kodansha) into the Chinese market. According to reports, in recent years large Chinese publications have been on the decline, while small (and usually copyright-infringing) publications are on the rise. According to the analyst magazine Periodical China, between 1989 and 1999, China's periodicals increased from over 5,000 to over 8,000 - a 37% increase; however, circulations remained around 2.5 billion. Currently China's city population is about the same as the U.S.'s, yet China's magazine circulation is only 1/5 that of the U.S.'s, meaning on average every person owns only two magazines. The report predicted that circulations will increase from 2.5 billion to 6 billion in ten years, just as it has increased from 0.7 billion in 1978 to 2.5 billion in 1988. The report also predicted that the advertising market has the potential to double, further benefiting the publication market. Based on the above analysis, it seems the current decline in manga publications can't all be blamed on the business market. Some say the reason Chinese manga publications are falling behind is due to a lack of innovation. It's good to study and learn from foreign ideas and strategies (especially from the Japanese market), but completely relying on the work of others will lead to a dead end. A quote from the late Chinese painter Qi Baishi was once brought up: "Learn from me and live, copy from me and die." 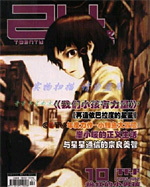 24 Frames, an excellent animation and movie magazine, faithfully translated works from overseas and obeyed the various publication laws in China (namely no copyright infringement), and soon it became a successful magazine that appealed to a wide variety of audience (the magazine ceased publication in May 2005 due to other reasons). Traditional comic magazines such as Comics Master, Comics Monthly, and other "5155" magazines such as Comics King, by moving in a direction that favors humor comics combined with traditional Chinese culture, their circulations have remained fairly stable. Three other examples are Comics PARTY, Comics World (the magazine that serializes Oolong Yuan), and Zhi Yin - Comics Guest, which are called the three musketeers of humor comics. A need to encourage and nurture China's own comic industry instead of relying on the idea of others. To focus on unique stories and tales that stem from the rich culture and history of China. Publications regularly make up "Top 10" lists. These lists usually praise foreign works while condemn Chinese works. There needs to be less promotion of foreign works and more promotion of native talents. The publication industry needs to work closely with the animation industry, so the two can better understand each other and thrive together. When a magazine's sale drops, its editors blame each other. There are many ways to publish a magazine. Both Futabasha's Comic Seed! and SOFTBANK Creative's Shounen Blood are successful examples of manga anthologies published on the internet. High expectations will result in a magazine's downfall. It's better to live a "lowly live" than to die a "glorious death." A "lowly live" does not mean to copy everyone else or to write bad articles, it means a magazine must grow at a reasonable pace, rather than always aiming for the top then failing. 2007 will be an interesting year for China's manga market. With the involvement of large Japanese publishers and more "official" manga being released, will China's original comics market be able to stand on its own? I dunno why i can't dw this. Submitted by Terenuri Constanta (not verified) on Tue, 2008-03-04 15:21. I dunno why i can't dw this. from any sources. can you help me ?